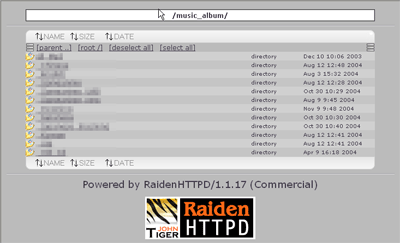 RaidenHTTPD enables you to effortlessly share your MP3/WMA music with friends on the internet or LAN environment via the built-in music album feature even if you don’t have any programming skill. 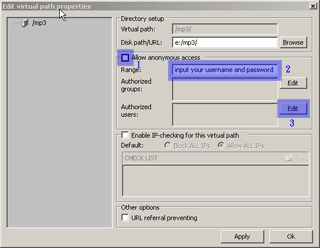 Open RaidenAdmin program->Configuration..->Click on Virtual options tab-> Select any virtual host you wish to have this enabled,->,check the Directory Index option within the Misc check box. First, uncheck the Allow anonymous access checkbox. And then enter a prompt text in the Range text box. 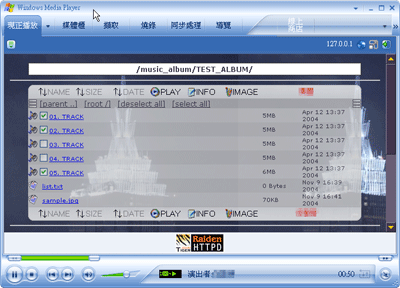 Finally, select authorized users who can access this mp3 album. Note that allowing everyone on the internet to access your MP3 album will be a bad idea, therefore it is strongly recommended to setup access control here. 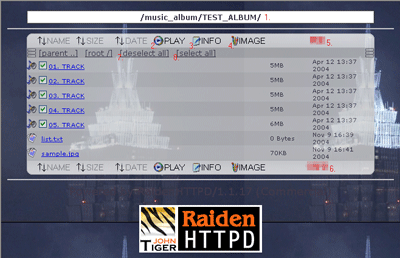 When it's all done, open an Internet explorer and open this Music album URL, such as http://127.0.0.1/mp3/. You should see a user/pass dialog box. 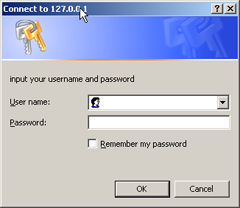 Enter your pre-added username/password and you will be able to login. 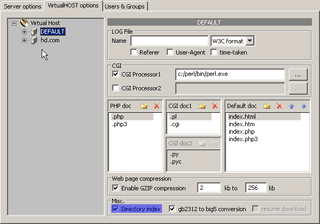 After you login, you will see the basic directory browsing page. The [parent ..] is the link to go back to the parent directory if the current directory is not the root directory. The [root /] is the link to go back to root directory. Now, you can click any of the directories that contain mp3 files and see what happens. When you enter any directory that contains MP3/WMA files, the music album feature is automatically activated. 3. Displaying .nfo or .txt file in the current directory automatically. 4. Displaying possible album photo files in the current directory. We try to select few of the music files by clicking PLAY button, which then launches the Windows Media Player. Next, what you will see is that the selected music album being integrated into the Windows Media Player. From this point on, all the music-related operations can be done by the Windows Media Player and yet the Internet Explorer will no longer be needed.